Women are underrepresented at UN climate conferences, and this year was no exception. With COP24 concluding on Saturday, it’s impossible to ignore the fact that yet another major round of global decision-making was conducted largely by men. That’s a problem, given that it’s women who already suffer the most from the impacts of climate change. Shortages in water, food and land can, for instance, create a greater burden for women who have to provide basic resources for their families. At the same time, studies suggest that women account for more than 75 per cent of the people displaced by natural disasters. As with the debate over birth control in the US, this means that men are creating policies that will disproportionately affect women. At the talks this year, delegations were split, on average, 63 per cent male to 37 per cent female. The problem spans the developed world and the developing: This year, Belgium, Portugal, Ireland, and Spain all sent delegations consisting of less than 40 per cent women. And 2018 wasn’t an aberration, but the norm. According to data compiled by the Women’s Environment & Development Organisation (WEDO), women similarly made up 37 per cent of delegations last year, while leading just 26 per cent of these negotiating groups. There has generally been an upward trend in the representation of women over time. According to WEDO’s statistics, in 2008, women led just 15 per cent of delegations, and made up just 32 per cent of these participants in total. In some ways that’s encouraging—although it is notable that the number of women leaders dropped dramatically in 2015, the year the Paris Agreement was negotiated and signed. But progress is certainly not happening fast enough: At the current rate of change, gender parity will only be achieved by 2040. The UN itself acknowledges the problem, and has drawn up a Gender Action Plan in an attempt to remedy it, including an ambition to “achieve and sustain the full, equal and meaningful participation of women in the UNFCCC process”. But even achieving equal representation is only a first step. How women are participating is another question entirely. “Even when we bring women into positions of power, they end up in discussions that are less powerful,” Bridget Burns, director of WEDO, told me. In climate policy, topics like adaptation, education, and gender policy are often considered “softer” subjects. These are all important parts of the discussion—they all appear in the Paris Agreement on climate change—but it’s important that women feature in discussions on finance, technology, and emissions reductions, too, she said. Varying cultural mores can also affect how delegations, including their female participants, interpret the very idea of “equality”. 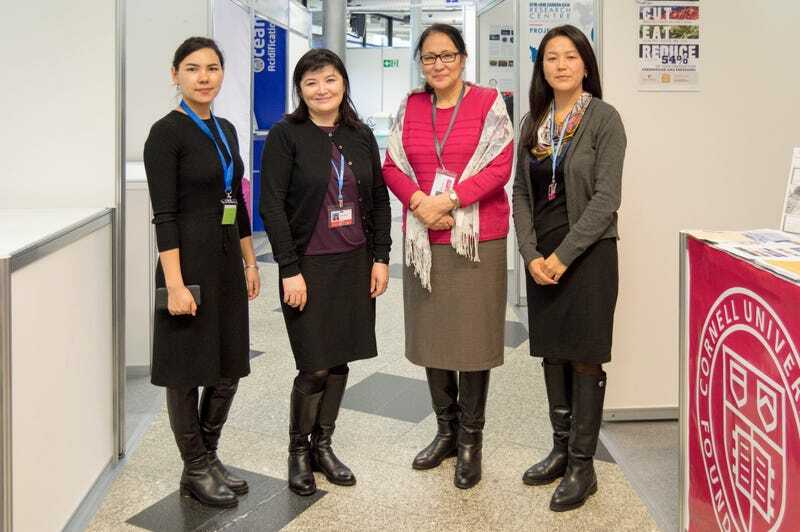 Case in point: this year, Kyrgyzstan sent the only all-female delegation, yet when I met up with four of their seven negotiators in Katowice, lead delegate Aizada Barieva told me she believes women are naturally less suited to positions of power than men, who, “due to their nature, are better at taking economic decisions”. As Burns fears, she suggested that women can perhaps take on “softer decisions” in climate negotiations. Barieva stressed to me that the all-female Kyrgyz delegation was a coincidence rather than a conscious decision, and said the math of how many women are represented isn’t important. “What matters is that real specialists are involved,” she said. But if those specialists are predominantly men, then women risk being overlooked, leading to policies that are ill-adapted to half of the world’s population. According to a report by Oxfam from 2009, market-based approaches to tackling climate change may worsen gender-based inequality if they don’t consider the differing roles men and women take on in society. The report also notes men and women may have different views on the role technological climate solutions, like carbon capture or biofuels, can and should play. To its credit, the Kyrgyz delegation did stress the importance of having women represented at these talks—even if that representation is limited, and compromised by cultural expectations. Aizada Kiiazova, an ecology specialist on the delegation, acknowledged that there was no way that the negotiations could go ahead without the input of women, given the serious problems that climate change is causing for women in Kyrgyzstan. The nation’s predominantly rural, agrarian populace is already threatened by melting mountain glaciers and worsening droughts, and women are feeling the impacts most acutely. “We have landslides and avalanches and floods, and women who are living in their house with a child, they are more affected by these disasters. That’s why it’s important to have women’s voices in the decision-making process,” she said. Perhaps, at the 2019 UN climate talks, those voices will be a bit louder. Sophie Yeo is an environmental journalist based in the north of England.